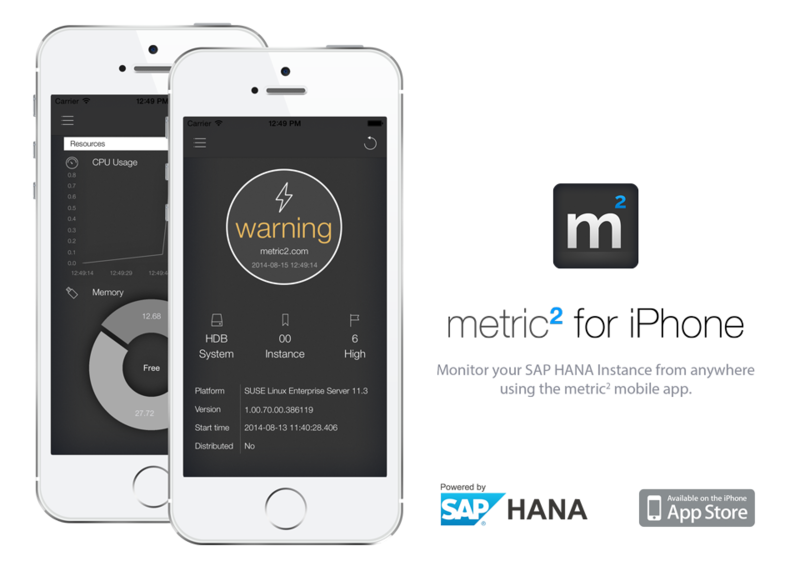 metric² for iPhone lets you monitor your SAP HANA instances from your phone showing you alerts, core resources and important metrics. Wherever you are. As mentioned in my GitHANA article, developing on the metric² open source project has really provided some interesting use cases for me around SAP HANA. While it might not be as critical as ERP, BW or custom solution, the metric² demo system is used fairly regularly by people wanting to test drive the functionality. I recently had some server troubles and my HANA instances was down without me knowing. This promoted me to develop a small mobile app to monitor and ensure that my instance was available and running optimally. This is when metric² for iPhone was conceived and I started developing the free app. The app is perfect for anyone running a HANA instance, be dev, test or production. It provides a really easy way to view the status of your system from anywhere using your iPhone. The app also downloads updates in the background and will notify you if any high alerts are experienced on the selected system, this is perfect for any sys admin/dba who will be to anticipate critical outages and be ready for the support calls. Click here to find the GitHub project (of the mobileapi.xsjs file) and click here to check out the product page. This includes install instructions. Building a native iOS (read Obj. C or Swift) which is integrated with SAP HANA is not terribly challenging and you really have 2 options for pulling or pushing data. Via a XSJS type file (like this app) or via a xsOData type of interface. Both have their pro’s and con’s but are fundamentally very similar. Below is a snippet of some of the code from my xsjs file and looks/acts very similar to what a regular AJAX call would use from a native XS app. One of the biggest challenges for production users, like any intranet based resource, will probably be gaining access to the URL (mobileapi.xsjs) from outside the corporate net and will probably require a network admin to grant you access or configure (or reuse) a reverse proxy or firewall.